Laurel Jean's Blog: Play Ball! 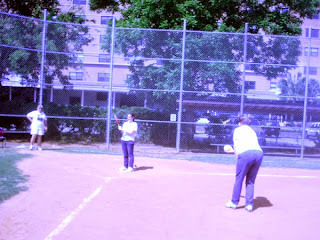 Debbie, Shelby's mom, pitches to Shelby during our spring beep baseball outing here in Charleston, SC. Over Memorial Day weekend, Dixie Land Guide Dog Users, Inc. introduced the sport of beep baseball to Charleston as part of Dixie Land's "Keeping Families Focused" Initiative. Beep baseball requires that all but three people on the team be either blind or blindfolded. The pitcher, the catcher and the umpire are sighted. The batter strives to hit an audible beeping softball that is pitched to him/her. If the batter hits the ball, one of two bases (first or third) is activated and begins to make a loud buzzing sound. If the batter gets to the base before the fielders get to the ball, a run is scored. If the fielders get to the ball first, the batter is out. During this first game here in Charleston, blind people of all ages got the joy of hitting a ball as it was pitched to them, completely independently, some for the first time in their lives. I thank God for the blessing of being able to support this event and share in the fun!